Back to back! I have another guest post from the incredible travel blog A World to Travel. This time we take you below the equator to a hidden gem of a city at the tip of Peru on the border of Bolivia and Chile: Arequipa. I awoke in the desert around Arequipa after being in Peru for a total of 18 hours and spent most of my time in the dark on a bus. I awoke surrounded by sand dunes, an element I am not so familiar with. I had been traveling for 5 months and had made my way from Mexico City through the lush rainforest covered countries of Central America that are dripping with foliage, brightly colored fruits and vegetables, multicolored flora and fauna, and electric streaked hummingbirds. So being surrounded by beige was unsettling. It was like driving through an ocean of suspended waves, frozen in time like a magic spell had been cast upon them, and the repetitive pattern of curves and swirls of the desert was meditative and occasionally boring. Then our bus began to elevate and made its way down a rockier mountainous path, an adjustment from our smooth sail through the desert. 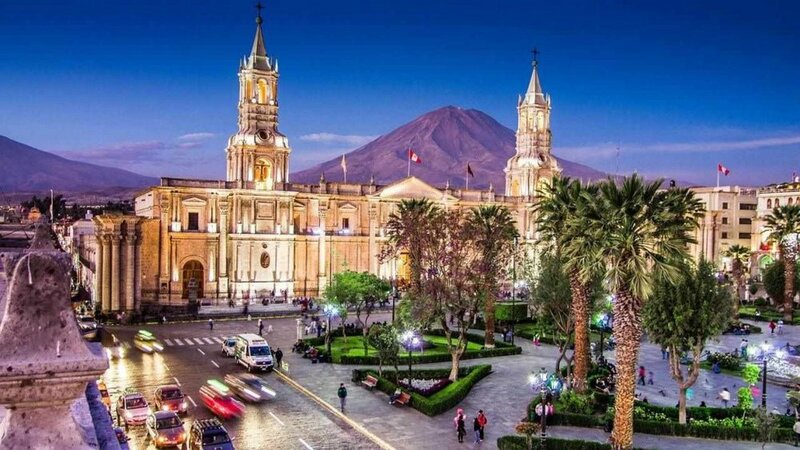 You can feel the rumble of Arequipa before you get there. It’s like walking towards a thunderstorm. As you drive closer, the power of the active volcanoes and city comes in clearer, but you are still surrounded by the silence of the desert. You are stuck between emptiness and everything. It’s hard to describe. We arrived when the sun broke over the city like an egg and began another glorious day. I arrived at Arequipa at 7 in the morning while the city was just waking up. In broken Spanish, I asked a combi driver ( cab driver) to bring me to where I would be staying. I was going to be working at a chocolate shop for the next few months and living with the other workers and owners. I stepped out onto white and beige cobblestone street. The air was crisp and dry with no water vapor between you and the sun. My hair for once wasn’t immediately curled. I put down my bags and took my first walk around the city. Once you step out into the cobblestone streets, you will feel a ubiquitous force that whisks itself around the city. You will find it in the streets, in the basements of monasteries, in the bites of ceviche. Maybe it’s that the walls of the city are made of the same material that hovers above them; the rock from the volcanoes have been repurposed to make a different kind of juggernaut. Maybe it’s the fusion of colonial Spanish, ancient indigenous, and modern influences condensed into one area. There is so much life in a such a small space, surrounded by extreme nothingness. The energy is trapped, like a frantic bee in a Mason jar. Or maybe Arequipa is special because we are always reminded of our existence. The volcanoes are always in sight, a constant reminder of their magnitude and your minutness. We can sense the lava flowing beneath the buildings and our bodies. It’s a place that reminds us we are alive and to not waste such an unlikely possibility. Whatever it is, Arequipa is an experience not replicated elsewhere. This is a great article filled with travel tips on where to go, what to eat, and how to experience the White City of Peru. 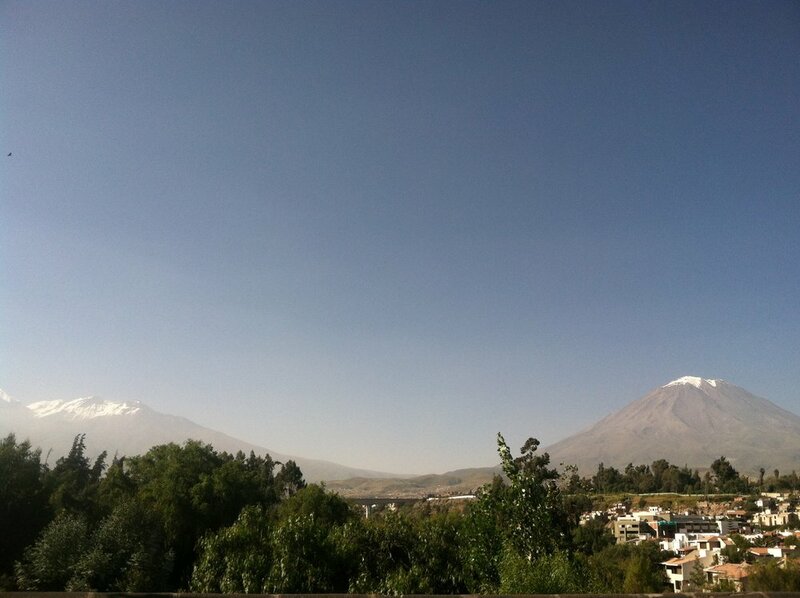 Arequipa has been safe to travel to for groups or solo travelers ( including solo girls!). It is cheap to travel to and great to travel throughout the year.